The Orphan Boy’s home in the 1960s. 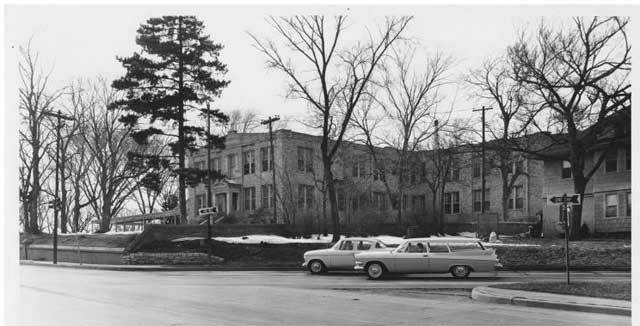 Before the current shopping center was built there in the 1960s, the corner of Westport Road and 43rd Street was home to the Kansas City Orphan Boys Home. Even earlier, the land was known as the Roger homestead, a nearly-five-acre tract of land with a big orchard behind it. The 12-room frame home, according to a 1896 Kansas City Star article, was shaded by a big forest and surrounded by a lawn of blue grass. A group of Kansas City women, however, began working to create an orphanage for young men. They found the perfect location in the old Roger Westport homestead. The same Star article described how the community saw the need for such an institution. The current site where the shopping center has replaced the Orphan Boys home. “The sisters of the order of Vincent de St. Paul care for the children and Sister Mary Joseph is in control. It is not a reformatory but a home and a school. It is the plan of the good women who founded the home that when its boys had finished the course of school studies they would be taught useful trades and not be thrown upon their own resources until they were fully prepared to earn a livelihood,” the Star explained. In a tragic twist to the story, Mrs. Perry and her four children Florence, Sadie, Katherine and Albert Perry, died in 1898 when the French transatlantic steamer La Bourgogne sank in the ocean. Her husband John Perry, general manager of the Central Coal and Coke company, gave $25,000 to the Orphan Boy’s home in honor of his family. The old home was replaced with a new structure which stood until the 1960s, which included dormitories for the boys, class rooms, reception rooms, and rooms for the sisters. 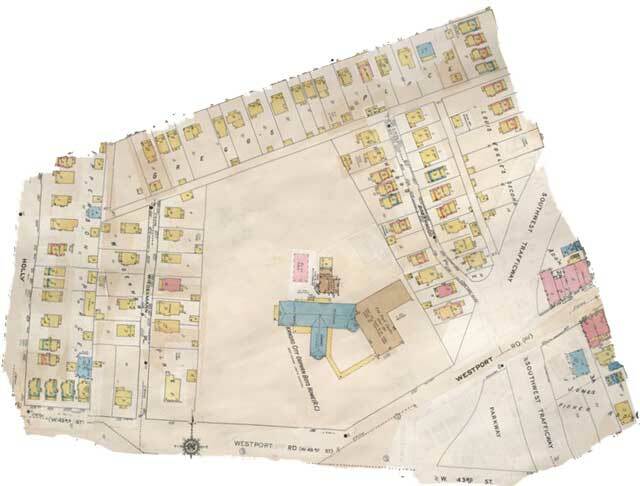 An old map shows the Orphan Boy’s home between Westport Road, Southwest Trafficway and 43rd Streets. Image courtesy Kansas City Public Library – Missouri Valley Special Collections. 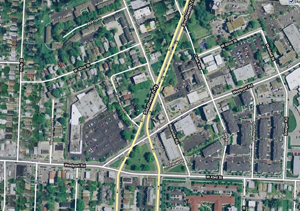 I lived in the 5th house North from Westport Road on that Alley by the Apple Orchard. On the West Side of the Street which was named (4216) Wiedenmann Place. I used to play in the trees in front of that Gorgeous Victorian style house on the Southwest Corner of the block and we’d watch cars on Westport Road drive under us while we sat above them in the trees! Eric and Annie lived there in the mid 1960’s and their dad used to collect and display butterflies! Mr. Rodemaker lived across the street from us. Mr. Edward J and Mrs. Dorthea Clamp lived in the red brick house and Mr. and Mrs. Rydings were our landlords next door. Thanks for sharing the memories!!! I went to Guardian Angel and Lillis High School with Richard and Jack Radamacher, they were really nice guys. My grandfather Lawrence Duffy was put in the Orphan Boys home at age 14, after his aunt convinced his widowed mom she didn’t have the money to take care of him and her other children. My grandpa was not in the least bit happy about this decision, so one night, soon after moving into the orphanage, he and another kid climbed out the windows and took off running, Grandpa back home to his mom and the other kid I’m not so sure about. On the other side of my family, my Uncle Dave Wheeler used to coach the Orphanage’s baseball team in the 1930s. I was one of the boys that was coached by Dave Wheeler but it was in the 1940’s actually 1947. Dave was a great guy and helped us a lot. He coached us to the city championship. I remember him taking us to his home once around 47th and Paseo just behind Paseo High school. The house was beautiful and really really big. Dave was a really good example for all of us. I think he had crush on me sister who came to some of our games. The semi pro team in Kansas City at the time was the Kansas City Blues and Dave knew some of those players and had them come out and practice with our team. Our team was sponsored by Byram Harrington motors. We were called the Byram Harrington Blues and had the exact same uniforms as the Kansas City Blues. We all really cared a lot for Dave, he had a really positive influence on all of us boys.. We were lucky to have him as our coach. I have a picture of our entire team including Dave with the boys home in the background. If you get this information and would like a copy of the picture please let me know and I will email it to you. My grandparents, John & Fanny (Krenn) Geier, worked at the orphanage. My parents, John & Josephine (Geier) Grauberger lived in the area, growing up and when first married, on Madison and Weideman Place. They were married at Guardian Angels church. My mother went to Sacred Heart School and also Guardian Angels. I was raised Catholic by Urseline nuns at St. Agnes but I remember as a child seeing the nuns from the orphanage come to visit my grandparents. I was fascinated by their nun habit with the big head cover that looked like they would blow away. They were so nice and kind and they were wonderful to my grandparents. I would love to know some of their names. I’m wondering if the nuns were relocated when the orphanage closed because I have some holy cards from who I think might be some of them. I think some of my grandparents relatives also lived in the area. Anyone that has any information or would like to “compare notes” can email me at carolb0713@gmail.com. Oh, it was all so long ago, but the memories and the memories passed down should all be preserved and shared with our future generations. It’s where we came from, who we are. One small thread can lead us to so much information. I just hope and pray that whatever I am able to discover and pass on will continue to be added to by my future generations. Do you remember what years your relatives worked at the orphanage? I also went to Guardian Angel school, what years did your mother attend there? Here are the names of the nuns that were at the Boys home in 1940. I believe my father spent time in the Kansas City Orphan Boys home in the 1920’s or 1930’s. I would like to find out who might be able to tell me where to go to obtain this information. His name is Donald Edward Bowman and he was born in 1920. He died when I was 16 and my mothere died when I was 19. I don’t know if the records still exist. Perhaps someone else knows and will respond. Here’s a link to Ancestry to the 1940 census that shows your father at the Kansas City Boy’s Orphan Home along with names of other boys there at that time. I would like to know if there is a registry for boys who lived there. I am searching for a David Lee Childers that may have lived there from around 1958-1962. Any help would be greatly appreciated. My father and his siblings were at the home in the late 1800’s to early 1900. At one time the boys tried to run away but were taken back. Some children were adopted, but dad was suposedly adopted by a widow lady that he said worked him nearto death on her farm, and by someone who took him and decided to take him back. A younger sister who was very pretty was taken by someone who dressed her in pretty clothes and sent her out to sing and dance on the streets, for money. Eventually all the siblings were able to reunite except for the baby. His name was James Emile Seynhaeve and he was adopted. The nuns told dad that he would recognize the new name if he heard it, but they wouldn’t tell dad who it was. My dad and his siblings spent years trying to find James, and here I am, 79 years old and the last of that family and I am still trying to learn about James. There are records if you can get Catholic Charities to let you see them. When I first contacted CC, I was told there were no records, but then I contacted the archivist and that sweet Father released the page that I was looking for, to be copied and sent to me. I would love to be able to learn the adoptive parents of James! At present , I don’thave the information of who I contacted with me, but it is in my records. I have one photo of my dad with his communion class. He was only able to get a 6th grade education. If I can help anyone with what little I have, I would be happy too. My sister in law was adopted. When we finally found her birth parents we discovered her father, David Lee Melton was also adopted. The only St. Joseph home that I remember was a girls home located at 31st & Southwest Trafficway. Never heard about any place near Swope Parkway. The only other I remember is the Boys Home on Westport Rd. My father, James Louis Rowland, lived at this Boy’s Home in the 30’s. He died when he was 36, so I never got to ask him about it. My Mother told me he was in Boy’s Town in Omaha, But Ancestry had him placed there and there was a whole list of kids and adults names. What was the fathers’ name? I may be able to help.